I am a Music Therapist and piano teacher. 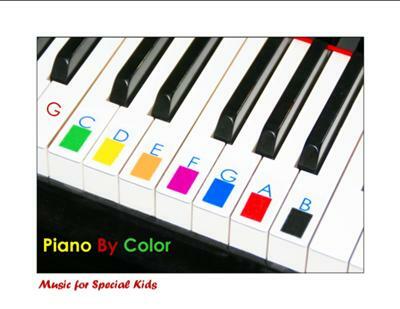 I have worked with 23 autistic children (all ages, all levels) on keyboard and piano skills. Several of my students were very interested in learning to play, but their attending skills, sound sensitivities, ritualistic tendencies, etc. made it very difficult for them to use a traditional method. I finally came up with a series of songs using color coding that worked vey well with many of them. It helped several of them so much that they eventually were able to move on to a modified traditional method. Pam, what a neat site! Thank you for letting us know about it! I start to teach them the notes and then draw a small keyboard on the page and they then write the note names in the corresponding color. After this I start to work with knownsongs and nursery rhymes and write the note names in the corresponding color. They use auditory memory, kinesthetic touch with colored texts to write the colored note names. Also by taking longer to absorb the concepts I can see this enhances the speed of learning as well as seeing them get a sense of achievement. Somehow color unlocks greater understanding than traditional note learning methods for children with Autism. Great to hear of others using these techniques. Would love to hear of further research with using colored notes for note reading and learning techniques. Some one finally figured it out,colors and letters makes it easy you see where your fingers should go,what keys are being used,repetition is a good learning process! !